In these lessons, we will learn how to find the derivative of the natural log function (ln). The Natural Log is the logarithm to the base e. where e is an irrational constant approximately equal to 2.718281828. The natural logarithm is usually written ln(x) or loge(x). The derivative of the natural logarithmic function (ln[x]) is simply 1 divided by x. This derivative can be found using both the definition of the derivative and a calculator. 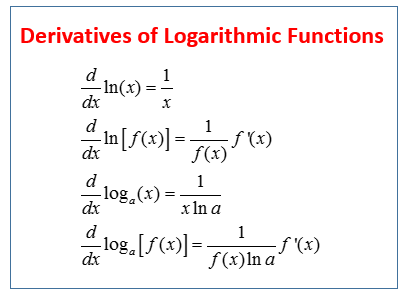 Derivatives of logarithmic functions are simpler than they would seem to be, even though the functions themselves come from an important limit in Calculus. What are the formulas for finding derivatives of logarithmic functions and how to use them to find derivatives? How to differentiate the natural logarithmic function? Determine the derivative of the function. How to differentiate the natural logarithmic function using the chain rule? We give two justifications for the formula for the derivative of the natural log function. If you want to see where this formula comes from, this is the video to watch.